Historically, Australia has been associated with adorable marsupials and blond guys with strange talents for taming terrifying animals. But for a growing number of people, the Land Down Under is starting to represent something else. Beers and barbies are making way for some pretty impressive statistics. The commonwealth has been relatively isolated from the global economic crisis (due in part to its proximity to Asian markets) and has come out as one of the most competitive places to work in the English speaking world. On top of having some of the most beautiful beaches and people on earth, Australia also has some of the most impressive economic indicators in the developed world. Its unemployment rate is 5.5%, which on its own is pretty awesome but when compared to the 7.4% and 7.9% the US and UK have respectively, it’s down right awe-inspiring. Not only are more people working down there, but they earn more than the folks in the US and UK. 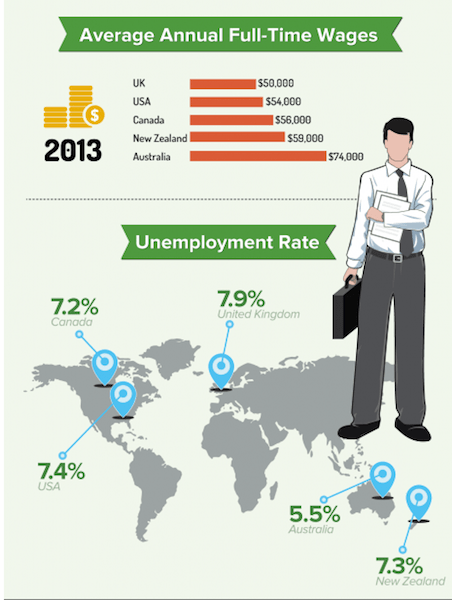 Aussies have an average income of $74 thousand USD a year. Just for perspective the average salary in the US is 50K a year. Oh and another fun fact for all you entrepreneurs out there – the World Bank rated Australia as being the second “fastest country” in the world for starting a new business. All of this comes at a price though. Getting a visa that permits you to work is going to cost a lot of time and decent chunk of change. Actually that’s the only statistic the USA beats Australia on, our visas cost around $420, theirs come in at around $900. If that’s not enough to get you to rethink your goal of learning how to play cricket, then the guys at 457VisaCompared have come up with a site and service that makes the whole process of relocating a little more palatable. 457 is the number given to the subclass of visas for people applying as skilled workers and allows them to work and bring their families to the country. The word “subclass” and three digit number are obvious indicators that this whole process of applying (and hopefully obtaining) a visa is long and complicated. High unemployment doesn’t just happen, and the government’s proactive role in keeping the economy going has made getting a visa a multi-step process. Before you start thinking about incorporating words like “brekkie” and “biscuit” into your venacular, you are going to have to think about setting up an Aussie bank account and getting health insurance (the latter being a visa requirements). Justin Grossbard, Adir Shiffman, and Noam Krobl have all worked internationally under professional visas, they also happen to have strong backgrounds in finance. This union of personal experience and personal backgrounds materialized into 457VisaCompared.com.au, a site that allows users to compare the different services and products associated with relocating to Australia for work. The majority of sites like this make money through commission, which is a pretty straightforward tradeoff. However the guys behind 457VisaCompared establish a sense of legitimacy and impartiality by providing side-by-side comparisons in a straightforward and user-friendly format. Even if commission is being made, users can walk away knowing the facts and can give their business to a provider that is the right fit for their needs. In an increasingly globalized economy, entrepreneurs are finding success by tapping into the pioneering spirit that has characterized both the US and Australia. The risks are high, but so is the potential for profit. Like the general store owners in the Wild West, sites like Grossband’s stand to make a profit regardless of whether their pioneering patrons strike gold.